At One Stop Craft Challenge we are having another challenge and the theme of this challenge is "Traditional Christmas Colors. 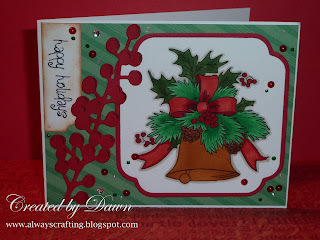 This card got picked as a favorite for the week on Splitcoast Stampers! I used a Robyn's Fetish image of a Christmas Bell our sponsor for this challenge. I really love this image and they way that it came out. I also used Lifestyle craft dies for the frame around the bell and for the berry plant die cut. The tag is from MFT. The sentiment is from The Greeting Farm. Have a great weekend and head over to OSCC and enter your own card. Lovely Dawn, I had to admit defeat on my Christmas card making this year, ho hum such is life!